Looking at the diagram, the inner layer with Heaven Gua while the outer layer is Earth Gua, with the move of four spots we find the Parents Gua. Western Gua originated from the East while the Eastern Guas originated from the West, North and South parents Gua mutually exchanging and inverted their position accordingly. This is in line with the saying that Southern Gua in coming dragon should be from the North and vice-versa. The inverted Guas serve to produce different outcomes for reasons, the offspring, and mother, grand parents Guas are derived by using the same formula that apply from ancient text of The Light Shed on Earth. The 9-stars allotment is mainly based on the early days Bagua setting. The interpretation of ancient text vary from school to school and master to master, as such it is believed that each will have its own unique and yet reasonable explanation. Nevertheless one must keep in mind in regards to the era that the text was written and the period the text was interpreted. I am Sure if some of us try to explain the logic by using today’s knowledge, we would have different version. 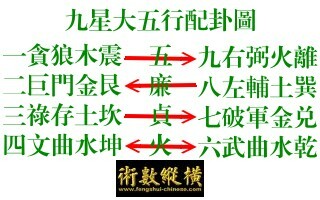 Let us see the explanation of Xuan Kong Fa Jian on three general Guas. Xuan King Fa Jian, the inner layer of Heaven Gua is referring to early Days Bagua while the outer layer is the Earth Gua with the transformation of 24-mountains Gua that is the explanation of Early days Bagua as body while the later days Bagua as application. Days Kin Kwan set on the South to lead thee female of Shun, Lei and Dui. As quoted ‘the parents is opposing each other on top and bottom, with the male and female in between. The Kin is opposing Kwan, Chan is opposing Shun, and Lei is opposing Ham, while Kan is opposing Dui. Ancient Scripture “Winter solstice as virtue while Summer solstice as punishment, Virtue of Chan emerged from Winter Solstice as first Yang surface, punishment of Dui from Summer solstice with the surface of single Yin. As quoted’ from Ham to Shun is clockwise while Shunt to Ham is anticlockwise four positions to place parents, this is the Three General Guas. The inner layer is the Early Days Bagua is meant for receiving ‘water’, while the outer layer transformed 24-mountians Gua is meant for harnessing ‘mountain’. For instance, should the inner layer of Heaven Gua is Ham, which is in command in the upper period 1, with Rat, Goat, Rabbit ad Snake transformed as Ham Gua, in line as harnessing the upper period for mountain. Another example, say Heaven Gua is Lei, that is Lower Period commanding Gua, the Earth Gua Horse, Rooster, Ox, and Boar transformed as Lei to harness the mountain energy. This is the Yin and Yang, static and dynamic and inverted theory and principle. 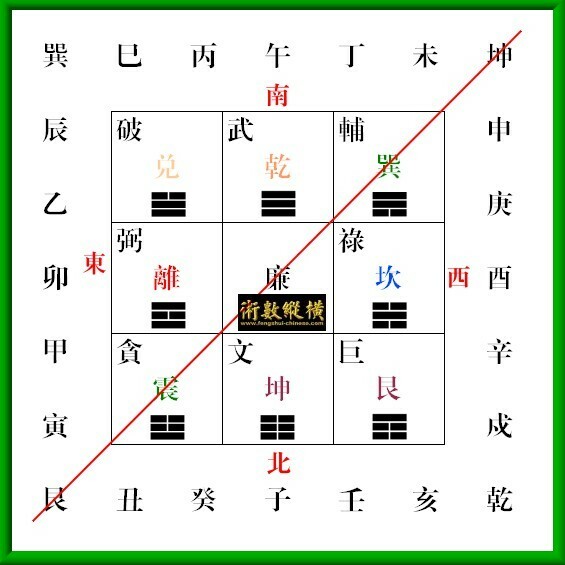 In the Xuan Kong Fa Jian Cycle Periodic Diagram, 1-white, 2-black, 3-Jade belongs to the Upper period, 4-Navy Green, 6-white, 7-red as Middle period, while the 8-white and 9-purple as Lower period. This is different from the 3 cycles 9 periods time concept and also not the same as in the 2-Period Cycle (only upper and lower period) Heaven Period of 90 years and Earth Period of 90 years!